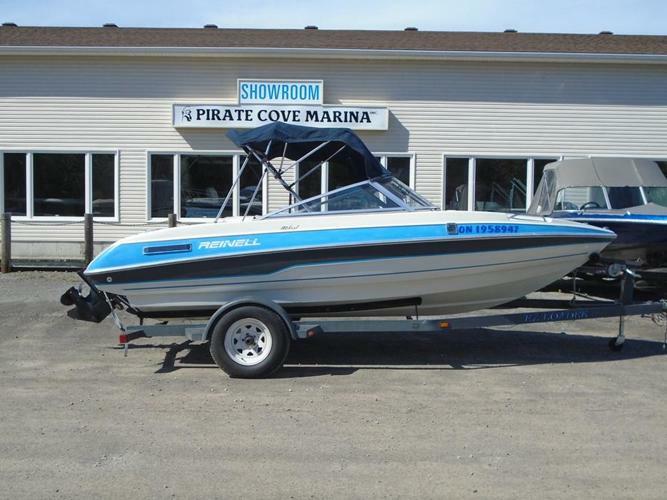 Nice clean family boat and very well powered with a 4.3 litre Mercruiser V6 180hp I/O. This Bowrider has twin back to back seats that are perfect to keep a watchful eye on your skiers or tubers as well as in floor storage for your accessories. The front seat converts into a lounger and the back seats also convert to make a sunpad for the sun seekers in the family. It is equipped with a bimini top and Kenwood AM/FM CD Stereo with Sirius Satellite capability. Also included are fenders and lines, marine safety kit, 2 paddles, and a fire extinguisher. This package comes on a custom bunk trailer and is ready for a nice fall weekend on the water taking in the beautiful colours.